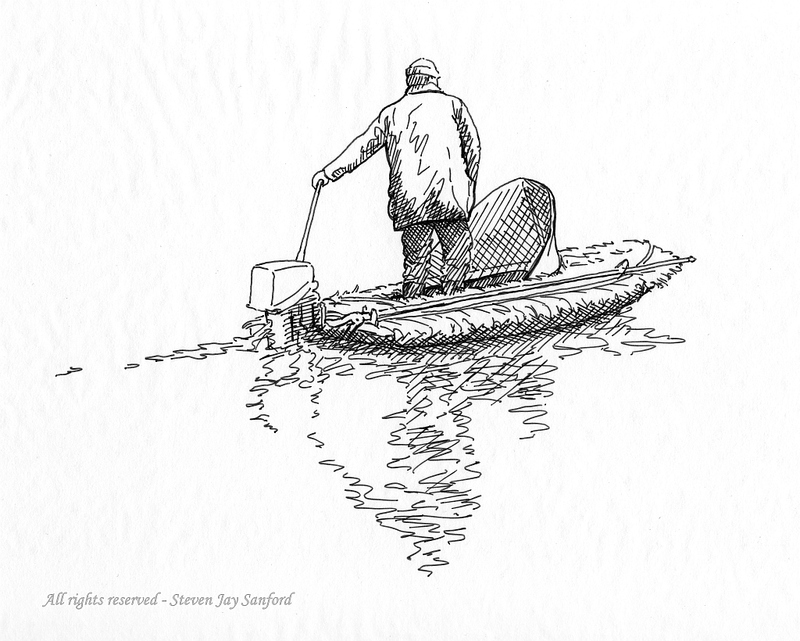 I have always enjoyed pen and ink. 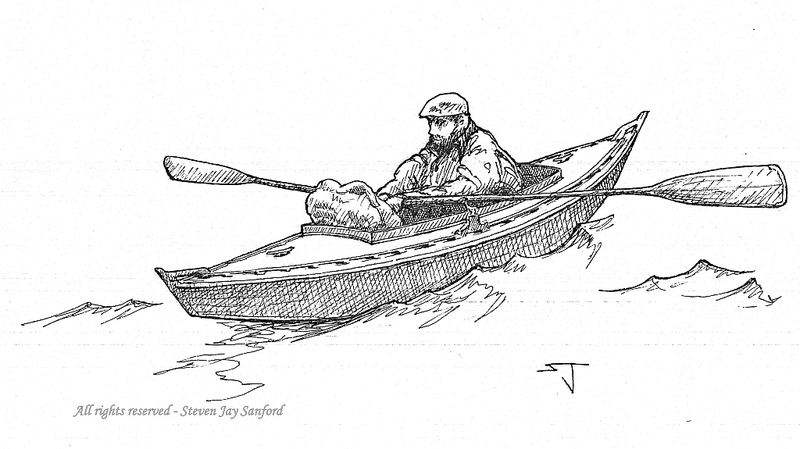 So many earlier books used this medium for illustration and I admire so many practitioners. Given my focus on birds and the natural world, it is not surprising that my heroes start with Earl L. Poole – who illustrated the text in the Audubon Water Bird Guide. Bob Hines – in Waterowl Tomorrow – played a similar role in my young attempts. I remain in awe of Francis Lee Jaques, Sigurd Olsen and Eric Sloane, among many others. I drew this image in 1982, I think. 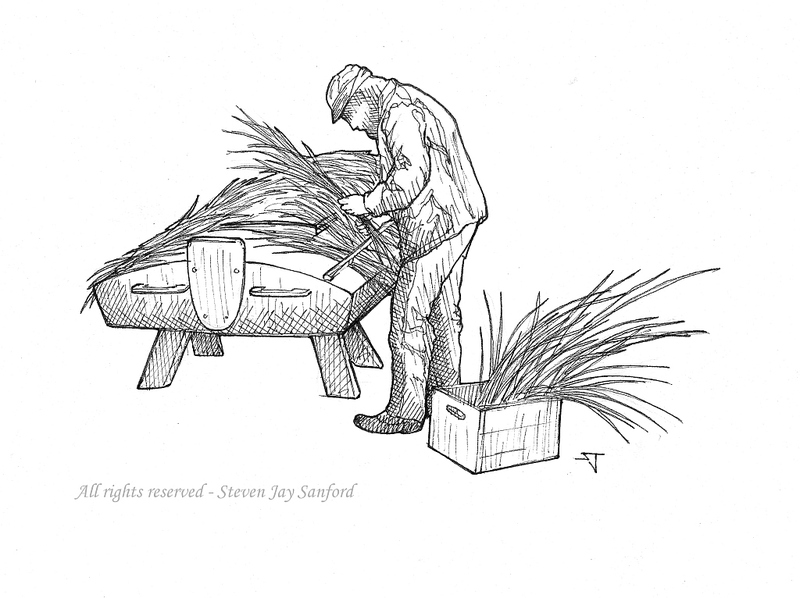 I took a photo of myself – thatching my first duckboat in the driveway in East Islip. 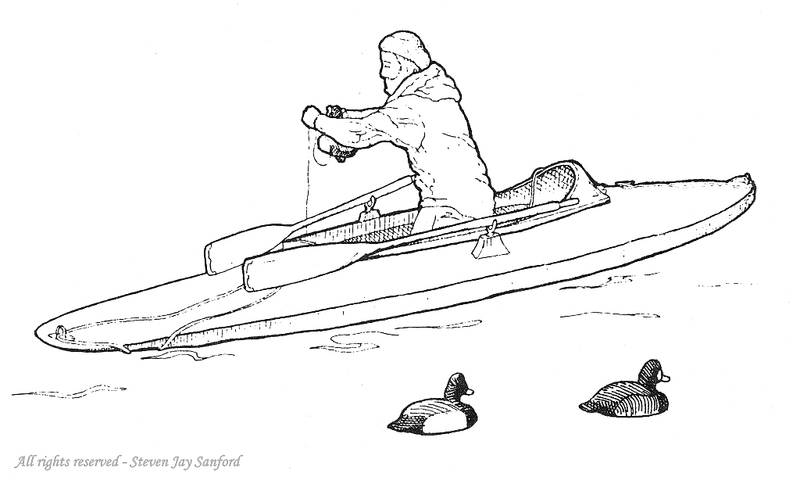 My immediate purpose was to provide a pertinent illustration for the annual Duckboat Show (only later was the “& Waterfowl Festival” appended) presented by the South Shore Waterfowlers Association (SSWA). Thatching the Grassboat has since been used on plates and clothing and the like. I drew this Scooter for the same purpose as the grassboat above. Picking up the Rig was used for the next year’s posters, et cetera , for the Duckboat Show. My brother Scott took a few pictures of the boat and me in Champlin’s Creek. For these drawings I used ink and some pencils, including even a bit of colored pencil. 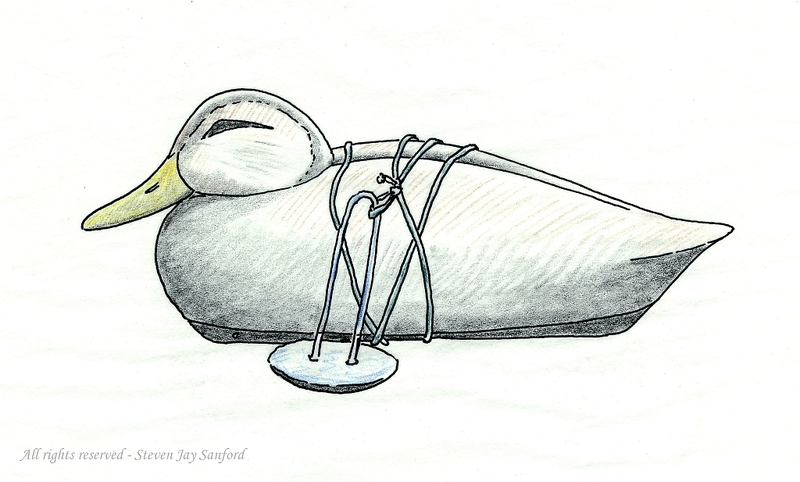 My concept was to provide appropriate icons for a decoy contest at the Duckboat Show & Waterfowl Festival. We had started a decoy contest while the Show was still at Heckscher State Park, but I recall that these were drawn only after it had moved to Cedar Beach. 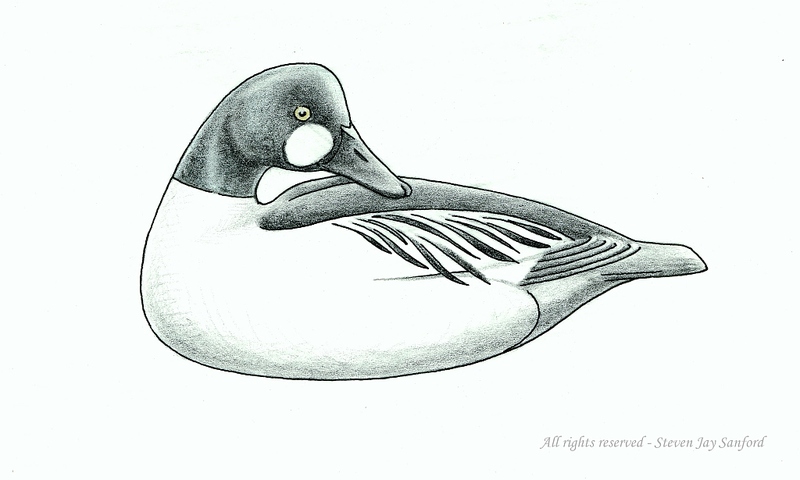 The Goldeneye depicts a “Turnback Whistler” made by the famed Charles “Shang” Wheeler. Although he was from Connecticut, we Long Islanders can lay some claim to him – but only because he dominated the early U. S. National Decoy Contest – which was sponsored by the SSWA for most of its 70-year existence. 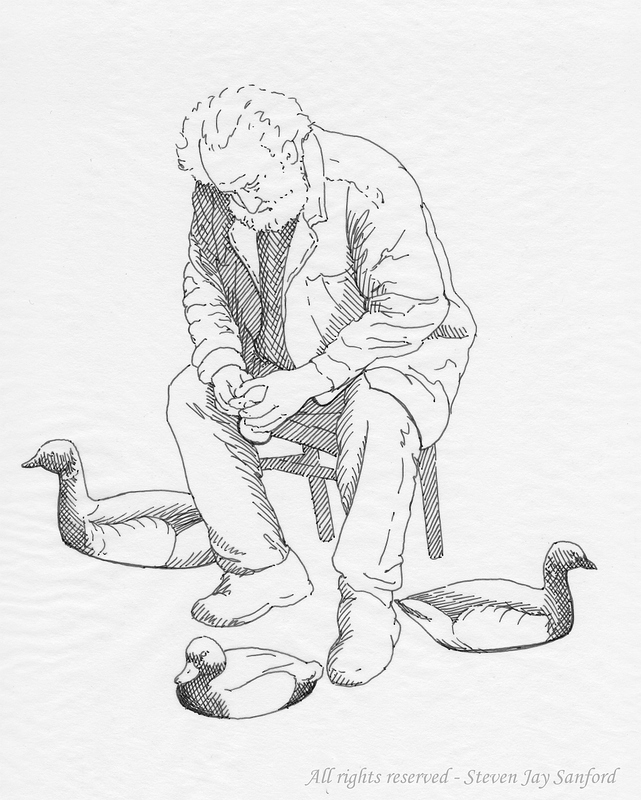 His work was chosen to represent fancier – but still traditional – decoys. 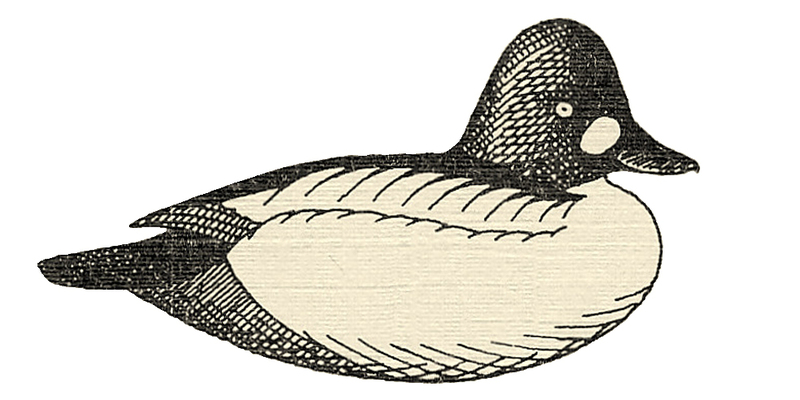 This Black Duck depicts the “bullneck” made by Al McCormick – Long Island’s own Mr. Decoy. I chose this bird to represent the true gunning bird. Made of black cork with redcedar heads, his birds were simple, rugged and very effective. This double-ender is not one of the iconic Long Island duckboats but served its purpose nobly. It had plenty of rocker in the hull, so showing it in heavy seas only made sense. Mike Fishman is at the oars. 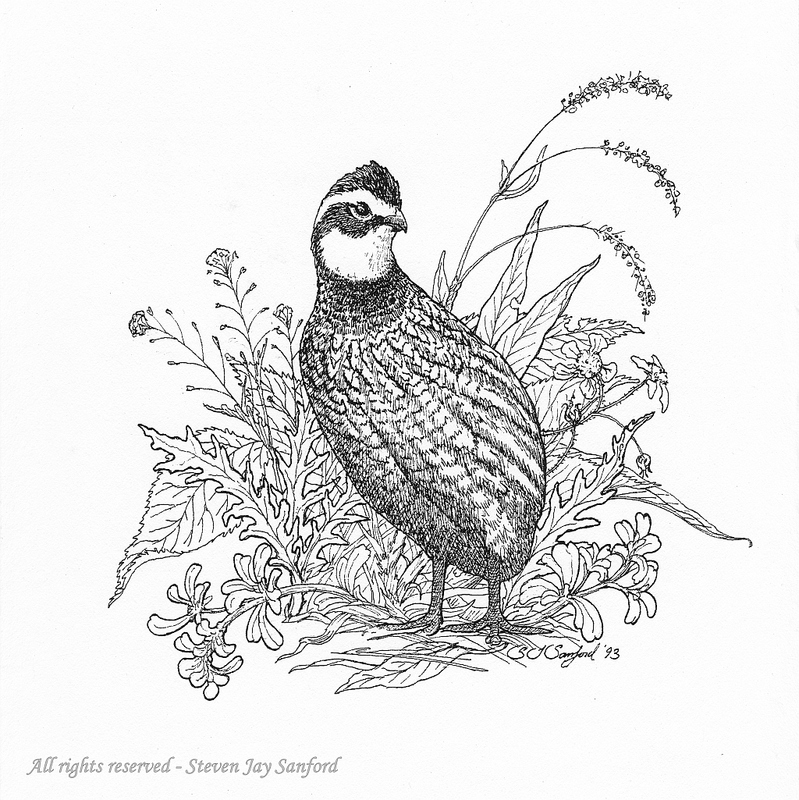 I drew and inked this Bobwhite as a gift for a DEC veteran – a retiree who had worked in the day when the “Conservation Department” raised and released quail. This is an image of me idling along in my Sneakbox – at the beginning or end of a hunt? I have painted this several times in watercolors as well and in pen & ink – I suspect I will render it in oils, too, someday. This drawing shows me in a posture and setting very common during the colder months. Like many of the other drawings, this was done for use by SSWA.